If the only thing stopping you from straightening your teeth is the fact that you don’t want to wear noticeable, conventional braces, then Invisalign is the perfect solution. 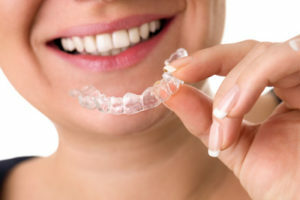 A type of aligner therapy, sometimes called clear braces, Invisalign uses invisible aligners to gently shift your teeth. These aligners are clear, removable trays made of plastic so you can take them in and out and you can keep on smiling without feeling self-conscious throughout your treatment. Since they are invisible aligners, most people won’t even notice that you’re in the middle of straightening your teeth with orthodontics. You can remove the aligners so you won’t have to change the way you clean your teeth or have to worry about food restrictions. The aligners are made of smooth plastic, which means they’re gentler on your cheeks and gums. Using state-of-the-art technology, each set of aligners gently moves your teeth closer to straighter smile so you can see the progress as you go. You’ll only have to visit our office around every six weeks for check-ins and to receive your next sets of trays. If you’d like to learn more about whether clear aligners are right for you, then feel free to contact our office or request an appointment online! The cost of Invisalign depends on your unique treatment plan, as in how complex your case is and how long (or how many trays) it will take to get to your smile goal. In general, Invisalign costs a little bit more than traditional braces but keep in mind that there is an extra level of convenience, comfort, and aesthetic improvement with that price. At Green Tree Dental, we think all of our patients deserve an attractive, confident smile, no matter their budget. We accept CareCredit® financing so you can break your treatment costs into smaller, monthly payments. Ask our team for more information!